Your favourite witch tackles a bully on a trip to medieval times! 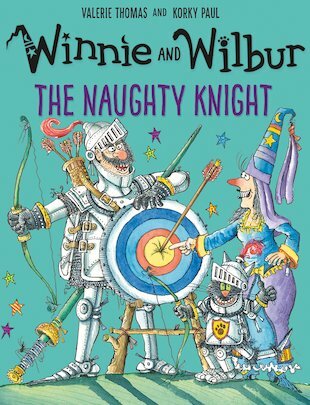 When Winnie and her cat Wilbur fly over a ruined castle, they wish they could see it in its glory days. No problem! With a wave of Winnie’s wand, she and Wilbur go back to long-ago times. Now the ruin is a mighty fortress. Even better, it’s a tournament day – with archery, jousting and a huge feast! But a naughty knight is being rude to his jousting rivals, and losing his temper at the banquet. Can a bit of magic stop his tricks?